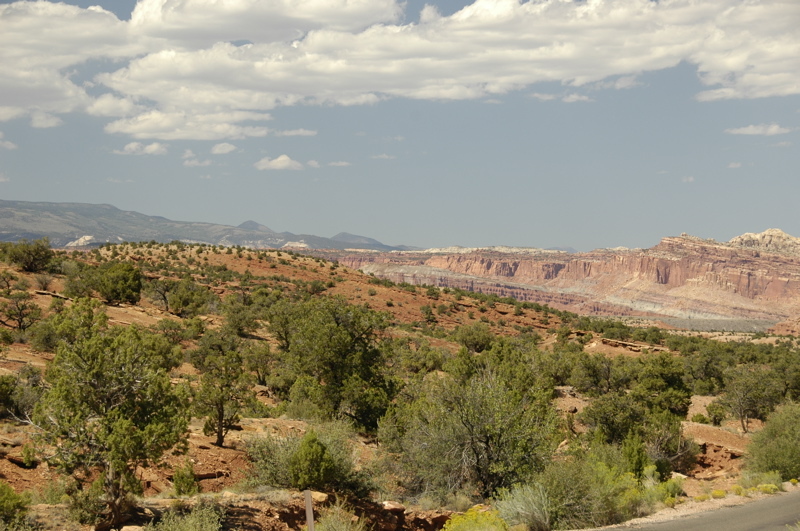 In my rush to post a quick blog entry yesterday I didn’t have time to describe the setting of Capitol Reef. The park is 100-mile long north-south sliver of Utah, surrounding an ancient fold in the Earth’s crust where tectonic plates collided, forced a ridge to the surface, and then weathered into remarkable canyons. They call this the “Waterpocket Fold” because the geography traps pockets of water which encourage plants and animals in this part of the Utah desert. Indeed, in the center of the Waterpocket Fold are the remains of the historic town of Fruita, where Mormon settlers lived from the 19th century until 1969 and raised fruit trees. The park is centered in Fruita, and the National Park Service still operates the orchards for visitors to pick fruit seasonally. Fruita is really a series of strips of lush cultivated land inside the canyons, flattened out and manicured into parklike settings. 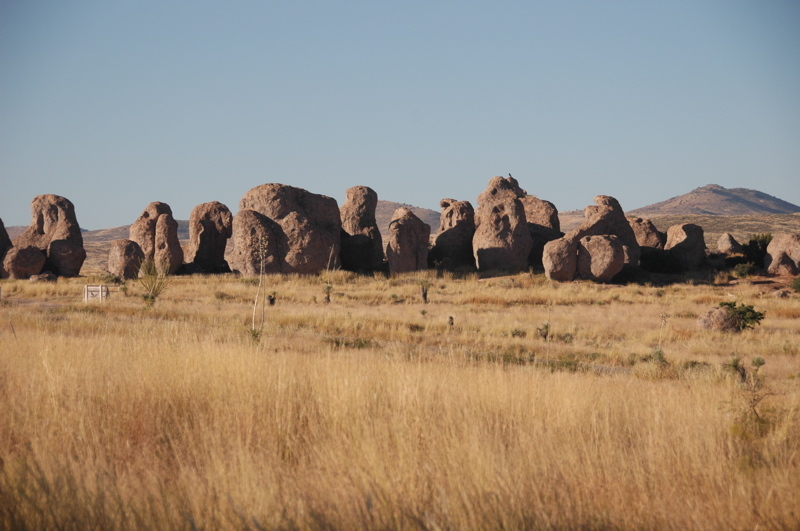 After driving through a hundred miles of red rock desert, it is startling to arrive in Fruita, where green grass and shade trees are everywhere, and a creek flows rapidly alongside the campground. It is like arriving at a city park, an oasis in the midst of dry sandstone and crystal clear blue skies. The skies are part of the reason the night stars and daytime views have been so startling. The average summer day visibility here is 145 miles! Very little pollution from southern California, Las Vegas, or southern Arizona arrives here ““ so far ““ and there’s not as much airborne dust, pollen, or humidity as other places. The result is magnificent views day or night. Yesterday we could easily see mountains a hundred miles away, from Panorama Point. In the campground our view is quite different. We are sitting in a canyon looking up at sheer rock walls on both sides. The sun reaches our solar panels more than two hours after it has lit the high peaks of the canyon walls, and we are in shade about two hours before actual sunset. (Fortunately, we are still getting enough solar power to keep up with our daily usage.) From the bedroom’s front window we get a marvelous view of the glowing red sandstone in the light of the setting sun each evening. The danger of visiting so many incredible western parks in such a short time is that you can begin to lose appreciation for them. It’s easy to say, “Ah, that’s just another pre-historic petroglyph,” or think, “I already hiked a canyon, so let’s skip that.” On a daily basis we are seeing things and hiking places so wonderful that any one of them would be the highlight of a week’s vacation. Too much of that is like eating too much dessert, and we don’t want to get sick of this only halfway through our planned loop of Utah. We also are spending a lot of time studying the history of the area (Butch Cassidy, Mormon settlers, the “Fremont people,” early European explorers, geologic history, etc.) I have been reading a book about Utah’s outlaws every day, in addition to guidebooks, maps, and interpretive signs everywhere we go. Emma has been working on Junior Ranger projects continuously for over a week, and she needs a break from that too. Even though we are having fun, we are constantly learning about where we are, and eventually that can be a burden too. So once again our trip plan is changing. (It will keep doing that.) Rather than rush down to Bryce Canyon today, we are spending another day, and possibly delaying our arrival in Bryce. Everyone is telling us that the Rt 12 route from Torrey to Boulder and Escalante is one of the most stunningly beautiful drives in the country. We were originally planning to cover the 118 miles from here to Bryce Canyon in an afternoon, but now I’m thinking we might take most of the day just to get to Escalante, or spend the night at Calf Creek (BLM) for a night. That will allow plenty of time to stop and take pictures along the way, or visit roadside attractions like historic sites. For today, our plan is very low-key. I’ve been working on the magazine since 7 a.m., and will probably spend the rest of the morning at that. Eleanor and Emma will go explore some of the historic structures of Fruita, and then around noon we’ll go to Torrey to pick up our mail and send/receive email at Robber’s Roost (a local bookstore/cafÃ©). We might drive another dirt road down a canyon just to see what’s there, but we won’t do any hikes. In other words, today is a day “off” from the schedule of hiking and studying. It’s funny how a day of business and errands can be a welcome relief from physical recreation. Emma has announced that on her day off she is planning to spend the entire day in bed reading. 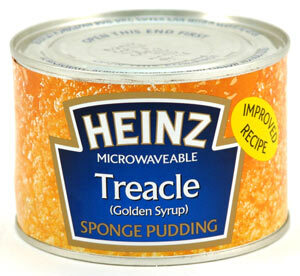 I think we’re all looking forward to a day like that. Late note: We found Robber’s Roost to be a very comfortable cafe (and smallish bookstore), but the free wifi didn’t work. There was a connection error when I tried to join the network with my Mac. We asked permission from the on-duty manager to unplug one of their computers and use the that computer’s Ethernet cable to connect to the network. He said it would be no problem. Later, when I was outside on the phone, the Uber-Manager showed up and bitched Eleanor out for connecting to the Ethernet. “I charge for that, you know!” Turns out she knew the wifi was misconfigured so that only PCs can connect to it (not Macs, for some reason), but rather than fix it she chose to blame the Macs instead. The on-duty manager was embarrassed. I could have fixed their wireless router but didn’t even bother to suggest it. The “high speed Internet” connection turned out to be dial-up, too. Go for the coffee, but don’t bother going for the Internet. Go to the burger shop instead. 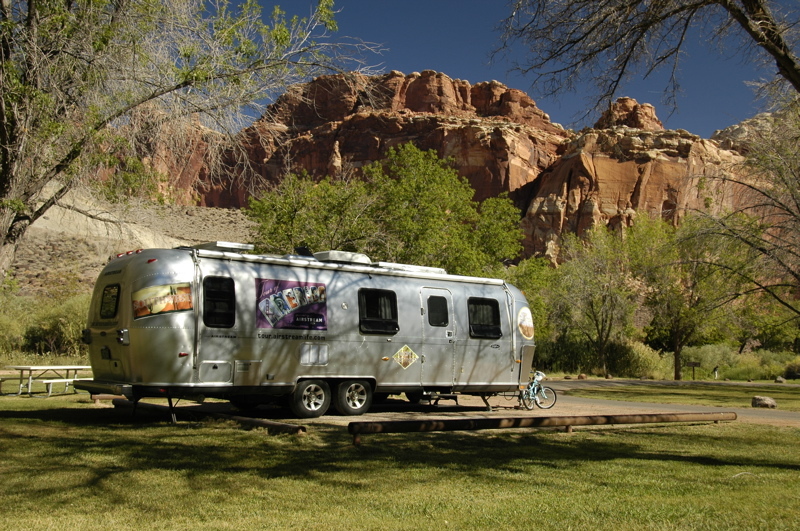 Second late note: There are few services near Capitol Reef Nat’l Park. Gas is available in Torrey (11 miles from the visitor center), but not much else. Verizon and Sprint have no service here. (We made a few calls “roaming” on some local network, but I’d be careful about that if you don’t have a roaming plan as Eleanor’s phone does.) There is one ATM that we know of, but it didn’t work. The town shuts down even more in the winter season, which I think means all the art galleries close. Come here with everything you might need. 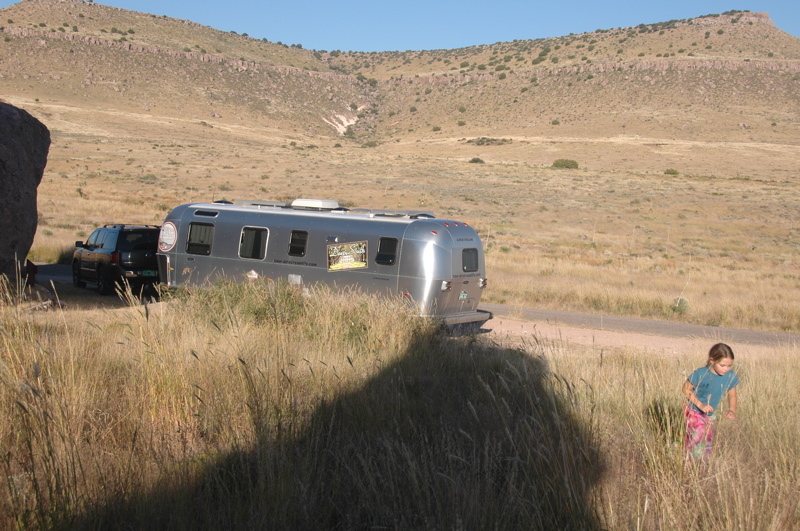 One of the reasons I decided to launch Airstream Life as a quarterly rather than a more-frequent publication was so that I would not be pressed by deadlines. In the past I’ve edited publications that came out every monthly or bi-monthly, and this is a hassle even for a professional writer. There’s never a moment when you are not thinking about the next issue, and usually the next three or four issues. To take a vacation from that sort of job, you must prepare finished work weeks or months in advance. Every paycheck comes at a very significant price: you must deliver the goods, with consistent quality and on time. The overall sensation is that you are juggling plates. A moment’s inattention, and the plates come crashing down to the ground, along with your job. Having a quarterly is easier, but a deadline is a deadline. They still arrive whether you want them to or not. Because of unexpected projects last week and our impending drop off the grid next week (as we travel through parts of southern Colorado where cell phones don’t work) I found myself buried with stuff to do all weekend. That meant no adventures beyond the laptop for Sunday. But we did manage to break away later in the day to visit Eleanor’s brother’s family in Colorado Springs. By September 1, I am supposed to have all the articles for the Winter 08 issue of Airstream Life edited and ready for layout. That seems unlikely. But somehow it always gets done, through a process of gnashing teeth and frantic typing, last-minute struggles to obtain decent photography, rapid-fire emails, and eventually a series of hard decisions about what makes the cut and what doesn’t. I remember many days where I was desperately trying to get online for just a few minutes to upload a critical file, and sometimes they are the most vivid memories of a particular place. There was the day I sat on a cold stone bench in Lake Louise for an hour, reviewing layouts, and another day sitting in the Marketing department at Airstream doing the same thing. I remember distinctly driving through somewhere in west Texas while Eleanor held the laptop computer and watched the progress bar of files uploading for nearly 30 minutes. Less than a minute after the final file uploaded, the connection dropped and didn’t come back for two days. It’s not much fun having to work when I’d rather be out playing, but I’m not retirement age and I must work. A lot of people look sort of pityingly upon me on those days when the weather is fine and I’m locked up in the Airstream and tied to the computer. I don’t mind, because it is far better than the alternative. It is said that “time is the only real commodity we have; spend it wisely,” and I agree with that. For me, “wisely” means trying to make the time I don’t have to work count. I always go back to the saying that “Nobody ever says on their deathbed, ‘I wish I’d spent more time in the office.’ ” That’s why I take the office with me. It’s not a burden, it’s an opportunity.